I just got home after an absolutely stunning fall day with my preservice teachers class – Education and Schooling. This year, I’m again using an old trick I learned from the amazing Benjamin Zander. I’m getting them to write letters to themselves. They write a letter to themselves, saying why they got an A in the class. They write about who they will be after a year in class. 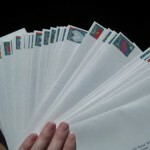 I give them an envelope and stamp and then collect the letters which I’ll post in May, at the end of Teacher’s College. I’ll let Benjamin Zander explain fully (like only he can) in this video excerpt. Find more videos like this on EFL CLASSROOM 2.0I am doing this for many reasons and not just for the surprise and joy of getting a “real” letter! I think it will foster and nurture a level of reflection but also, it will help tamper down the competitive demons that seem to plague both teaching and especially “becoming a teacher”. The students seal their letters and I won’t be reading them. 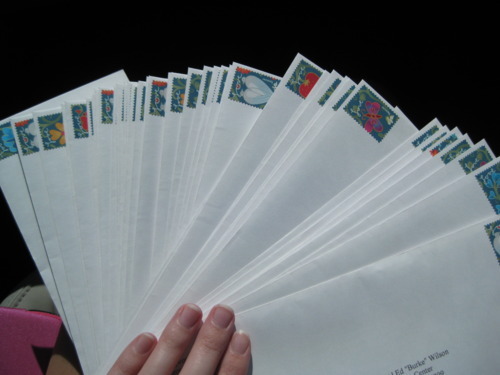 This is for themselves only and they are the only ones to be surprised or disappointed by the letter they’ll receive. We get what we put in …. I’m writing this blog post because I also, in the vein of being a teacher that “participates” with students and practices his own constructivist principles, wrote a letter. I wasn’t intending to share it on this blog. However, I left my folder with lesson notes/plan and the letter at home. I couldn’t read it to my students. So alas,this compromise. Find the letter to myself below, for student reading but might be of interest to any and all teachers. Please forgive the length! I deserved my A because I gave it my best shot. What I mean is that given whatever our circumstances as teachers, we really have that as our yardstick and measure. I don’t agree a lot with the current mantra of “weed out the bad teachers”. There are no good or bad teachers – we are all adrift in the wind of our own circumstances and the only heights, the only bar we need climb over is that – we did our best. This year I challenged myself in several ways and that’s why I got an A. One. I asked my students to be responsible for their own learning and to be their own engine and light. I challenged them with the task of taking the curriculum provided and learning it of their own volition, curiosity and need. It was tough at the beginning but with time, students saw the classroom as a place of inquiry and thought, where their battle was only with themselves. And they grew more responsible and receptive of that freedom I gave them. I deserved my A for avoiding teaching by numbers and allowing teachers to grow into their own teaching skins, boots, beliefs. I got an A because I came prepared to my classes. Sometimes less, sometimes more – but that’s life. My best was done. I got an A because I think I modeled a type of teacher we might want in our schools and profession. One constantly engaged in professional development, transparent and sharing ideas and resources. There is no finish line. I deserved my A because I learned from my students and didn’t just teach them. When one teaches, two learn. Lastly, I got an A because despite the dark, wretched winters here, I kept seeing the cup half full. Kept the class thinking and positive. Kept engaged and engaging knowledge. Kept being happy to come to class and have a place to be a teacher. It was never a chore but an honor. It’s been a great year. I’ve developed so much. Like a tree, I have one more circle added and that will forever embrace and mark me. Next story A Student’s Death. Who’s guilty? I really like this idea. I like how personal it is, and how for students the letters are really only for them. It puts them in the driver seat from the get-go and creates a self-fulfilling prophecy that, hopefully, is a good one ! I’ll tell you in May, when I get my letter, if I got an A! But I love this idea and I let Benjamin give the assignment, I just have to sit back and drink my cuppa. Sorry, won’t be in Paris after all and will have to tell the conference committee – but will make it a point to get there in the new year, hopefully we can meet up and I can also get stocked up on Cafe Noir! Aha… don’t know why I thought this letter was from last May. I love this idea. We’ve done letter to self before but not related to learning goals. I must try this with my online writing group! Yep, try it out. It really is as Zander says, a way of seeing things as they should be – that we live into what we are instead of living up to what we should be. I know it all seems so philosophical but just do it!